Recently published as part II of a previous part I published on January 31st, this Retail Touchpoints article deals with Social Commerce with a stronger emphasis on social curation, a must to know for all retailers. Enjoy! “In Part I of this Social Commerce feature, Walmart toldRetail TouchPoints: “The first generation e-Commerce sites brought the store to the web. We think the next generation will be about building a multichannel experience that integrates the store, the web and mobile seamlessly, with social identity being the glue,” Ravi Raj, VP of @WalmartLabs, stated. Underscoring Raj’s and Cole’s comments, Facebook’s recent IPO to raise $5 billion, as well as its reported 65% boost in 2011 net income, emphasize that social networking and e-Commerce are fusing to present significant opportunities for retailers to further engage with brand advocates and loyal shoppers on a more intimate level. In Part II of the Social Commerce Report, several retailers share their social commerce success stories and insights about its future. Social ratings and reviews are key to improving the online shopping experience and subsequent conversion rates at Ice, an online jewelry retailer. Though not a new strategy, Dave Haber, Senior Director of Social Media, told RTP that “Ice continues to focus here because allowing our customers to rate, review and better educate onsite visitors has been one of our most powerful forms of social engagement. “In fact, we see customers that create, read or share ratings or reviews converting at 2.5-times the rate of an average site visitor ― that’s a 250% improvement in the conversion rate,” he noted. Another area of social commerce Haber’s team is focusing on is the idea of social curation ― the ability for people to curate selections of products, brands, imagery, etc., in order to create their own personal lens of shopping needs and experiences. Haber points to a site called Pinterest.com, which allows participants to organize web clippings onto a virtual bulletin board and share them with friends. For example, for Valentine’s Day, visitors can create a board called “Jewelry Gift Ideas,” and attach (or “pin”) a necklace or earrings from Ice. Pinterest users can click through “pinned” items to access the product detail page at the Ice homepage and ultimately make a peer-recommended purchase. Haber also sees online gaming as a huge social commerce opportunity that can impact the ways consumers interact with online retailers and brands. The NRF’s “Social Retailing Blueprint” study looks at “gamification,” defining it as the use of game play mechanics and dynamics for non-game applications, products and related services. This tactic is used in consumer-driven web sites and mobile applications to encourage sustained engagement or incentivize other behaviors. Gamification in the context of retail operations and social marketing tactics helps drive customer transactions. Online shoe retailer Shoebuy.com, for example, tapped gamification to double advertisement click-throughs and boost share rates via Facebook by 50%. DKNY was among the retail initiators of social gaming. Today that group includes Best Buy, CafePress, Gilt Groupe, H&M, Nike, Rue LaLa, Simon Malls, Sport’s Authority, Valentino and many others. The opportunities for social commerce tactics continue to branch out. In January 2012, Facebook announced 60 new web partners that will appear in the site’s users’ Timeline offering. Timeline is a new profile that gives users an easy way to “share and highlight your most memorable posts, photos and life events on your timeline. This is where you can tell your story from beginning, to middle, to now,” according to Facebook.com. Fab.com — One of the 60 new Facebook partners is Fab.com, an e-Commerce marketplace for design. In a recent blog about its social commerce innovations, Fab.com’s CEO Jason Goldberg, revealed: “Fab is thrilled to be among the first to launch a timeline app. To get started, you can opt-in on Fab to add the app to Facebook Timeline, your future purchases will be shared on your Timeline, and you’ll be able to discover the items most popular among your friends through the Facebook News Feed and ticker. Clicking through on the Fab Member’s username then shows that user’s Fab Profile, which displays all of the items the member has purchased, faved, or added to the Fab Inspiration Wall. [This] Social Shopping launch is just the start. We’ll be continuing to forge ahead and innovating at the intersection of social and commerce,” said Goldberg. Brookstone — Bill Wood, CIO at Brookstone, said the chain’s recent partnership with SWAGG, a gift management app extended Brookstone’s reach into the mobile social commerce space. It did this by allowing consumers to give and redeem gift cards via their mobile device, as well as access offers and promotions from any smartphone. He described the strategy during his presentation entitled “Technology-Enabled Social Media” at the Social Commerce Strategies Convention in Las Vegas late January. SquareTrade — A service provider of extended warranties for consumer electronics, SquareTrade leveraged social commerce to promote its services in conjunction with the release of the iPhone 4S. Looking for a cost effective way to spread and track word-of-mouth, SquareTrade launched a hybrid of Social Referral and Social Sweepstakes products. Coupling the two products added a viral aspect to the referral campaign, which was promoted via email and Facebook. The campaign included two offers: $10 for every referral, and $100 for every five referrals, with referrers getting $5 off their warranties as an incentive to buy one. SquareTrade also gave away “50 iPad 2’s in 25 Days,” a program allowing referrers to enhance their chances of winning by sharing, since both the chosen winner and the individual that referred them received an iPad 2. In the first 10 days of the campaign, more than 10,000 SquareTrade brand advocates were identified. Advocates shared with an average of five friends, and the campaign generated more than 60,000 social shares across Facebook, Twitter and email. Referrals drove 500 new customers, each purchasing a $100 product. 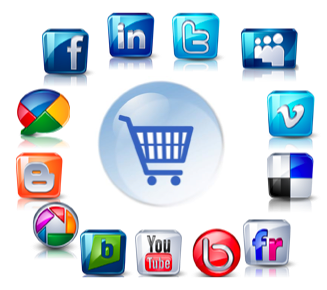 Dozens of vendors have recently entered the social commerce space, including Adgregate, Baynote, Bazaarvoice, 8th Bridge, Extole, IBM, Moontoast, Oracle, Payvment, ShopIgniter, 360i and TurnTo, all helping to distinguish social commerce as the new era of e-Commerce.